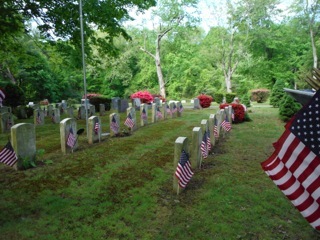 On Saturday, May 28th at 8 a.m., New Canaan’s Veterans of Foreign Wars will place a new flag on the gravesite of every Veteran buried in New Canaan. New Canaan Patriots of all ages are invited and welcomed to participate in this annual event. Participants should meet at the lower Veterans section of Lakeview Cemetery, using the Main Street entrance. There will be coffee, donuts and juice provided. Any questions should be addressed to Post Commander Peter C. Langenus at 203-966-7480.